Bruce Lee was first a child actor before becoming an international acclaimed Kung Fu fighter and superstar. In his childhood, he played in 23 films in Cantonese language from 1940 to 1959. His most famous "child movies" are The Kid, Infancy and The Orphan. His adult career started in 1968 although he starred in his most famous four films from 1971. He gained overnight fame with low-budgeted Big Boss in 1971. In 1972, He pulled the nationalist strings and found the box office favours with Fist Of Fury. In 1972, he directed and played the lead part in The Way Of The Dragon. Finally, he co-produced with Warner Bros. Enter The Dragon which was released in 1973. His first three movies were all huge successes in HK. However, Enter The Dragon, despite its international success wasn't considered very commercially or critically successful in HK. 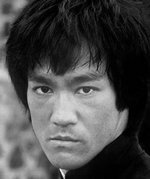 Bruce Lee died in 1973, leaving his fifth movie The Game Of Death uncompleted.